If you have no idea about multimeter and you want to know about it then you are at right place. Sometimes you want to test batteries or electrical appliances but you don’t know how to check it for that purpose it is necessary to have knowledge of multimeters. Here we give you a brief description of multimeters, its types, its comparison and safety precautions. 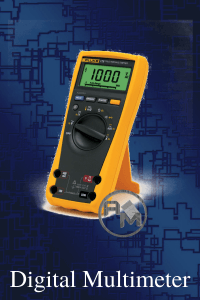 A Multimeter is easy to handle tool used to measure electricity, Ac & Dc voltage, Ac & Dc current, and resistance, etc typically over several ranges of values. It is just like a stopwatch to measure time or a scale to measure weight. Today’s lots of variety of multimeters are available in the market depending upon the requirement of the people. For selecting different electrical parameters for measurement most of the multimeters have a rotary switch or a dial on its front panel. It is basically a multipurpose electronic testing device known as moving coil instrument used for measuring voltages, currents, resistances etc. The display of the multimeter usually relies on a microammeter whose pointer moves over a scale calibrated for all the different measurements. You can easily measure different quantities by changing the switch setting or range on the device itself with the use of various detachable probes. It is the most usable test equipment used in the electronic industries. It uses a liquid crystal display screen and a frequency selector switch that gives a straight forward output in a decimal form. 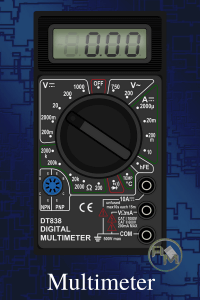 To provide better accuracy, digital multimeter obtains several samples of the signal during a short period of time and it also offers automatic ranging feature so that user does not have to select the measurement manually. Nowadays we prefer Digital multimeter more than Analog multimeter because of its accuracy, faster response, LCD display screen, etc. Most of the time we are confused between these two multimeters so here we provide its comparison table below which clear your confusion and helps you to select a good one for your work. It is a basic question arise in your mind that what it can measure and how it helps us to solve our problems. First all you have an idea about the working principle of multimeters and how does it work, after that you will automatically understand the basic measuring phenomenon of multimeters. Well, multimeters measure several electrical parameters like Ac & Dc voltages, Resistances, Ac & dc current etc. 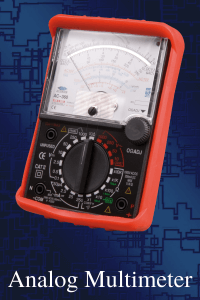 Today’s advance multimeters come with additional features and measures frequency, temperature, Capacitances etc also. Some multimeters have the function of testing continuity, Diodecheck which helps in checking the circuit loose connections etc and the lets the current flow in one direction in the circuit. During continuity check, it resulting in sound beep when two circuits is electrically connected. Its sound beep ensures that the circuit is right connected without any loose connections and prevent short circuits. During Diode check, it ensures the direction of flow of current in the circuit. Before doing any measurement, it is recommended to have some knowledge of basic terms. We explain some terms below have a look over it. (i) Voltage: According to ohm’s law voltage is defined as the product of current and resistance. It tells us how electricity is pushed through the circuit. Higher the voltage, higher the electricity is pushed harder. Its unit is Volts and expressed as V.
(ii) Resistance: It basically obstructs the path of flow of current. More resistance will results in lesser current flow through the circuit.Its unit is ohms and expressed as Ω. (iii) Current:It indicates how much electricity flows inside the circuit. It is dependent on the resistance value because both are inversely proportional to each other. Its unit is Ampere and expressed as A. (iv) Alternating current voltage:This type of electricity generally flows in residential areas or in our houses. Its frequency is 50 Hz. If you need to measure alternating current in a circuit, different multimeters have different symbols to measure it usually “ACA” and “ACV,” or “A” and “V” with a squiggly line (~) next to or above them. (v) Direct current voltage: This type of electricity is generally flows in auto and household batteries like AA or AAA batteries. Its frequency is 0 Hz.Different multimeters have different symbols for measuring direct current usually “DCA” and “DCV,” or “A” and “V” with a straight bar above or next to them. (vi) Capacitance: It is a passive device used to store electric charge. Its unit is Farad and expressed as F.
We are using Analog/Digital multimeters for the measurement of AC voltage, AC current, DC voltage, DC current, Resistances etc. By using integrated circuit technology, most digital multimeters provide some additional capabilities like measures capacitances, Temperature, Frequency, Diode test & continuity Test. To make measurements more accurate using digital multimeter without any loss or damage we have to follow a number of initial steps & precautions because old people say prevention is better than cure. (i) Ensures probes are in good condition: If probes are not in good condition then there are more chances of inaccurate readings. During high voltage measurement if probes are broken or cracked, it will cause more risk of injury to the user. (ii) Check Battery Regularly: Batteries are the main part of any electronic equipment because without this you cannot provide power to the device and every Digital multimeter requires power for their operation. If batteries are left in locally for long periods they can leak and damage the contacts in the instrument because the contents of the battery are corrosive. So, it is recommended to check the battery regularly and replace immediately if required. (iii) After use always return meter to high voltage setting: To prevent the possibility of accidental damage by the meter being set to a current or low voltage range, it is always recommended to set the meter to high voltage after use even if there is an off button. Some meters are auto ranging which automatically set current & voltages as per need, but some are manually operated that’s why we have to take care of this factor. Hope this article will help you.We always welcome your suggestions.